On the 13th (Tue), explore the historical opulence of Pittamiglio"s Castle, take a stroll through Pocitos, then take in the architecture and atmosphere at Iglesia San Juan Bautista, then pause for some serene contemplation at Iglesia de las Carmelitas, and finally admire the masterpieces at Museo Municipal de Bellas Artes Juan Manuel Blanes. Get ready for a full day of sightseeing on the 14th (Wed): ponder the world of politics at Palacio Municipal de Montevideo, make a trip to Plaza Matriz, contemplate in the serene atmosphere at Catedral Matriz, then admire the masterpieces at Palacio Taranco, and finally kick back and relax at Playa Pocitos. To find photos, other places to visit, and tourist information, refer to the Montevideo online trip maker . Bogota, Colombia to Montevideo is an approximately 7.5-hour flight. You can also drive; or do a combination of bus and ferry. Traveling from Bogota to Montevideo, you'll lose 2 hours due to the time zone difference. Plan for somewhat warmer temperatures traveling from Bogota in November, with highs in Montevideo at 27°C and lows at 15°C. Wrap up your sightseeing by early afternoon on the 15th (Thu) to allow time for travel to Iguazu National Park. On the 16th (Fri), explore and take pictures at Minas Tierra Colorada and then take in the dramatic scenery at Salto Bernabe Mendez. Get ready for a full day of sightseeing on the 17th (Sat): take in the dramatic scenery at Iguazu Falls. To see traveler tips, maps, reviews, and more tourist information, use the Iguazu National Park journey maker site . Do a combination of flight and car from Montevideo to Iguazu National Park in 6.5 hours. Alternatively, you can do a combination of flight and shuttle; or drive. Plan for somewhat warmer temperatures traveling from Montevideo in November, with highs in Iguazu National Park at 34°C and lows at 20°C. On the 18th (Sun), you're off toBuenos Aires. To see reviews, where to stay, maps, and tourist information, go to the Buenos Aires trip itinerary planning website . You can do a combination of shuttle and flight from Iguazu National Park to Buenos Aires in 4 hours. Alternatively, you can drive; or take a bus. When traveling from Iguazu National Park in November, plan for a bit cooler days in Buenos Aires, with highs around 28°C, while nights are about the same with lows around 19°C. Cap off your sightseeing on the 19th (Mon) early enough to travel to San Carlos de Bariloche. You'll discover tucked-away gems like Kayaking & Canoeing and Parque Nacional Los Arrayanes. Step out of the city life by going to Fishing Charters & Tours and Catedral Alta Patagonis. There's more to do: enjoy the sand and surf at Playa Bonita. To see ratings, traveler tips, photos, and other tourist information, you can read our San Carlos de Bariloche online trip planner . Getting from Buenos Aires to San Carlos de Bariloche by flight takes about 5.5 hours. Other options: drive; or take a bus. Traveling from Buenos Aires in November, you will find days in San Carlos de Bariloche are a bit cooler (21°C), and nights are cooler (3°C). Wrap up your sightseeing by early afternoon on the 23rd (Fri) to allow enough time to travel to Peulla. To see maps, reviews, ratings, and other tourist information, you can read our Peulla attractions website . Explore your travel options from San Carlos de Bariloche to Peulla with the Route module. The time zone difference moving from Argentine Time to Chile Time is minus 1 hour. Traveling from San Carlos de Bariloche in November, you can expect nighttime temperatures to be a bit warmer in Peulla, with lows of 7°C. You will leave for Puerto Varas on the 24th (Sat). Overlooking a lake, with a conical volcano looming in the background, Puerto Varas enjoys memorable scenery but retains its authentic atmosphere. Your cultural itinerary includes sights like Iglesia Sagrado Corazon de Jesus and Casa Yunge. 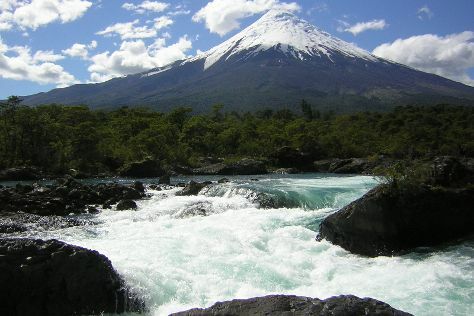 Escape the urban bustle at Parque Nacional Vicente Perez Rosales and Volcan Osorno. Make the 26th (Mon) a memorable day with a climbing tour. The adventure continues: explore the world behind art at Museo Pablo Fierro, choose your vessel at Pionero del Lago, pause for some serene contemplation at Catedral de Puerto Montt, and enjoy the sand and surf at Angelmo. For maps, other places to visit, where to stay, and more tourist information, use the Puerto Varas trip planner . The Route module can help you plan travel from Peulla to Puerto Varas. In November, daily temperatures in Puerto Varas can reach 19°C, while at night they dip to 7°C. Finish up your sightseeing early on the 27th (Tue) so you can travel to Montevideo. Start off your visit on the 28th (Wed): don't miss a visit to Plaza Independencia, then see the interesting displays at Museo Casa de Gobierno, then take a stroll through Ciudad Vieja, and finally take a stroll through Mundo Pedal. Here are some ideas for day two: get the lay of the land with Walking tours and then do a tasting at Bouza Bodega Boutique. To see reviews, where to stay, maps, and tourist information, refer to the Montevideo vacation maker site . Do a combination of shuttle and flight from Puerto Varas to Montevideo in 8.5 hours. Alternatively, you can do a combination of bus and flight; or drive. The time zone changes from Chile Time (CLT) to Uruguay Time (UYT), which is usually a 1 hour difference. Plan for somewhat warmer temperatures traveling from Puerto Varas in November, with highs in Montevideo at 27°C and lows at 15°C. Finish your sightseeing early on the 29th (Thu) so you can travel back home.